Graffiti artist ErmOne, who is originally from the North of England will be traveling over from his studio in Paris to exhibit a collection of work produced exclusively for his show at The Soup Gallery in Truro, Cornwall. The Soup Gallery is extremely excited to welcome an artist who rides high in the estimation of his peers, a style captain who has been rocking on top with his groundbreaking approach to graffiti for over 15 years. ErmOne is well versed in applying his unique style to any given platform whether it be canvas, concrete, metal or paper. Never failing to drop a mad fresh flavour that leaves fellow graffiti writers awestruck and eye candy enthusiasts hungry for more. 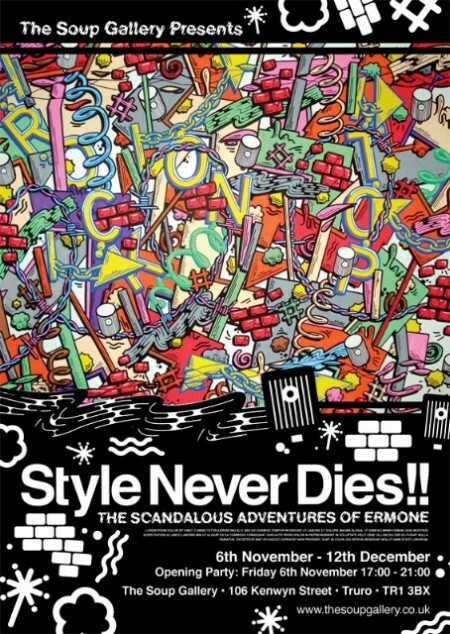 ‘Style Never Dies: The Scandalous Adventures of ErmOne’ is an exploration of the classical graffiti elements – letters, arrows, connections, drips, splats and clouds. The funk master will be flexin’ his unique style with an exhibition of framed original paintings and photographs, with a price range to suit all pockets. There will be an opening party for the exhibition on the evening of Friday 6th November at The Soup Gallery 106 Kenwyn Street, Truro from 5 p.m – 9 p.m.
Refreshments will be provided together with live music, everyone is welcome.